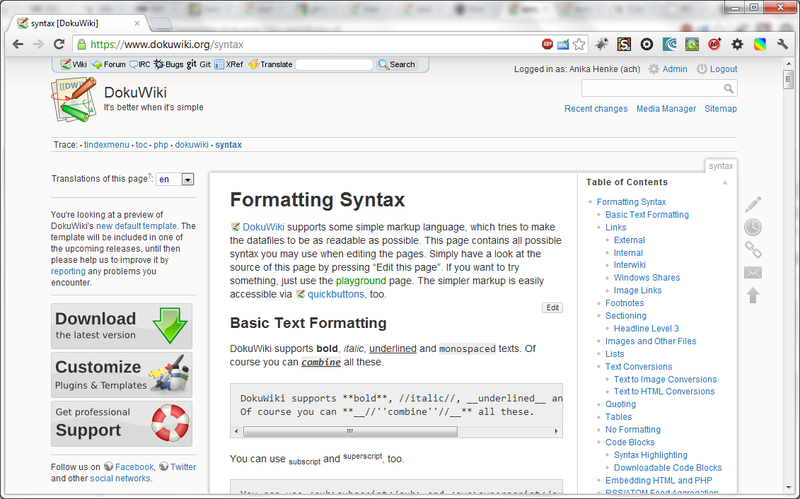 DokuWiki's layout can be customized through templates (aka. skins or themes). Since some template features change with newer DokuWiki releases it's best to stick to templates with release dates that are equal or more recent than the DokuWiki release you're using. It cannot be guaranteed that older templates provide the full set of features. For important changes please check the changelog. Note: half of the download-links don't work, so don't get too enthusiastic about a specific template, or check the download button first. From version Ponder Stibbons and upward1) the installation and upgrading of templates is automated by using the Extension Manager. It lets you search and install the templates as listed below. 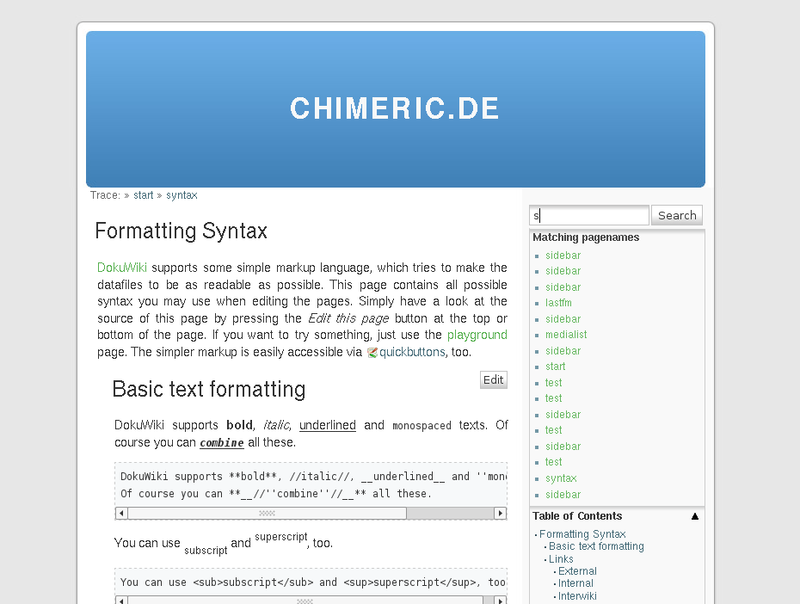 Or you can install your own template via the Manual Install tab. Filter available templates by using the tag cloud. You could also search within the template namespace using the search box. Compatible with DokuWiki? 2018-04-22 "Greebo"
Compatible with DokuWiki? 2017-02-19 "Frusterick Manners"
Compatible with DokuWiki? 2016-06-26 "Elenor Of Tsort"
Compatible with DokuWiki? 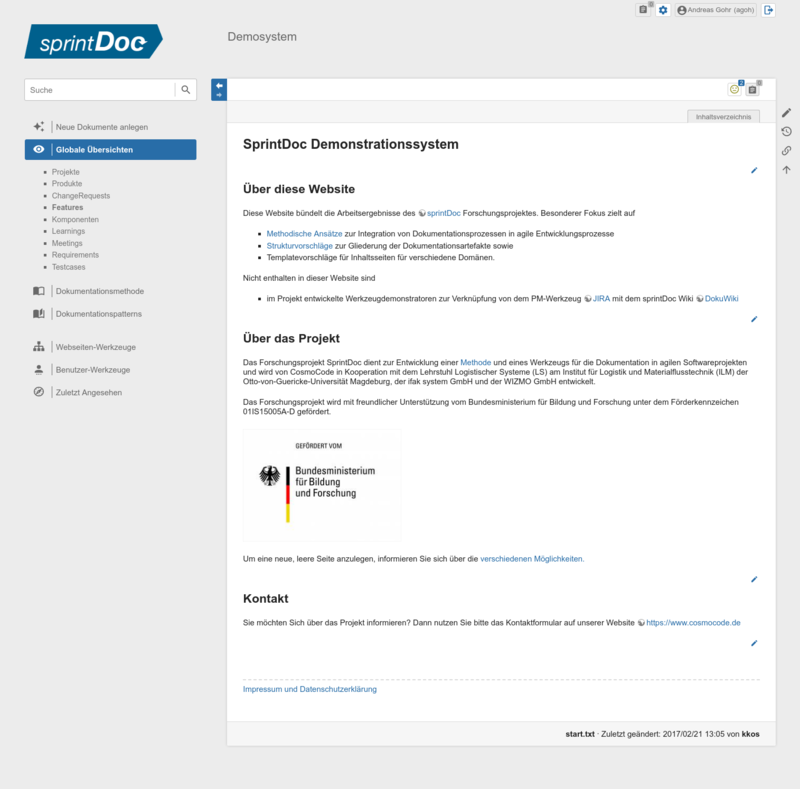 2015-08-10 "Detritus"
Another DokuWiki responsive template using Twitter Bootstrap & font awesome. Supports for toggleable dark theme to save energy of mobile phone. Compatible with DokuWiki? 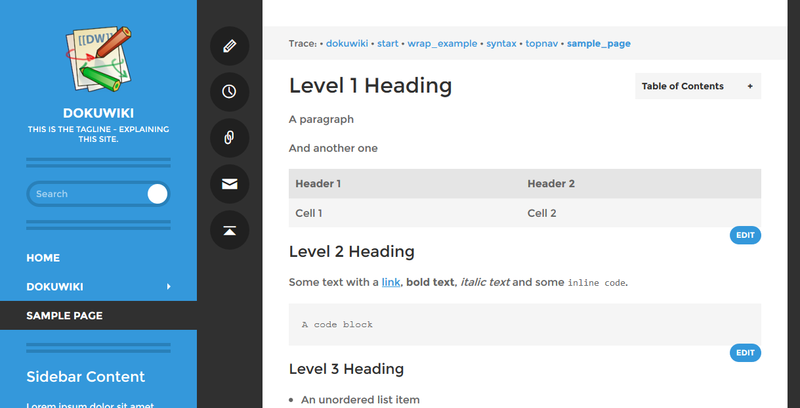 2014-09-29 "Hrun"
A plain template based on Starter with a responsive, semantically-marked layout and a logical reading order. Renders page in plaintext. Based on starter template. Will use text renderer if installed. You can use loadskin plugin to load with template for specific namespace. 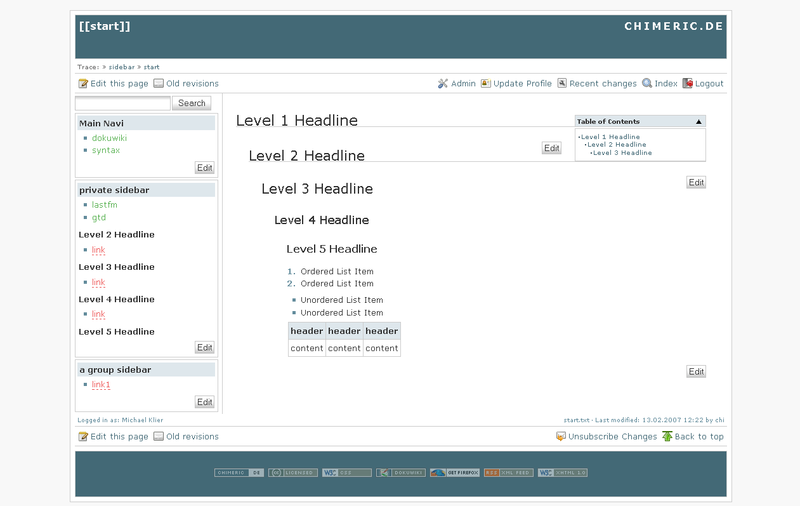 Rounded boxes that divide the page in a header, sidebar and main content area. 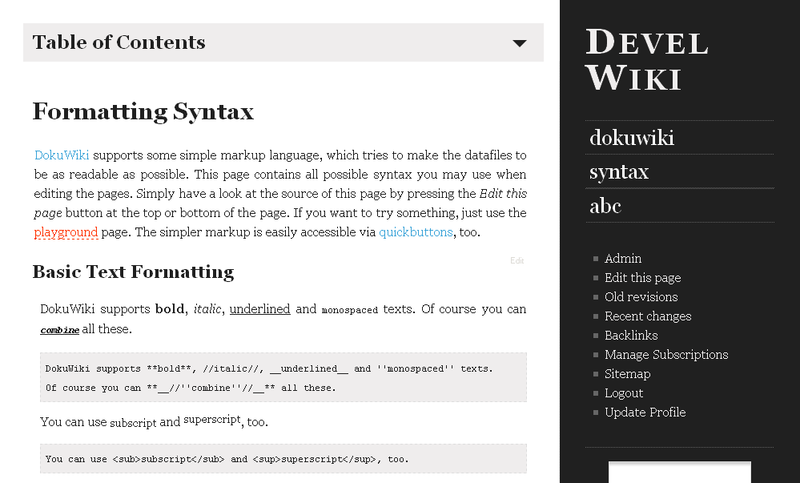 Writer’s a customisable designer @fontface dokuwiki template designed for literary purposes. Compatible with DokuWiki? 2014-05-05 "Ponder Stibbons"
This theme brings wiki back to basics. Choose between pre-populated boostrap themes for your preferred appearance. Clean and uncluttered blue look that nicely resizes. With configurable tab navigation. 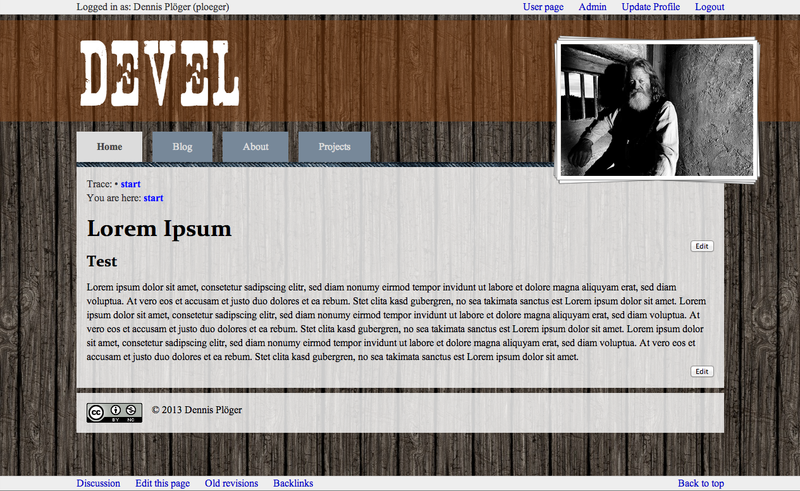 Clean layout with sidebar, three fixed widths and six predefined colour schemes. Compatible with DokuWiki? 2013-12-08 "Binky"
Compatible with DokuWiki? 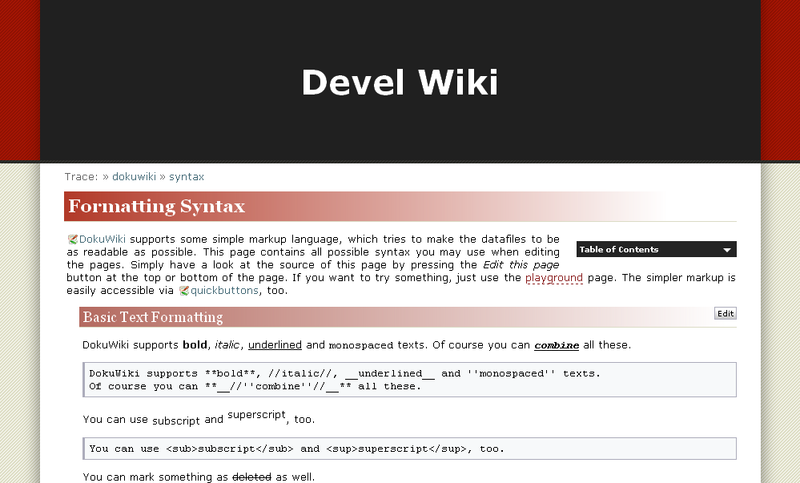 2013-05-10 "Weatherwax"
This theme wraps DokuWiki in a Bootstrap theme. A clean and simple template, with a small navigation bar at the top. A dark theme, based on the Design of Mac Heist and the technology of arctic. Template based on Backpack (the service from 37signals). Clean and clear Typography that will change a bit soon. Colors based on Solarized. Gumby Framework underneath. Frames without frames: Uses a dynamic CSS-Layout Engine for creating variable fixed style layouts. A bright green template based on the main layout. Sitemap and TOC on the left. 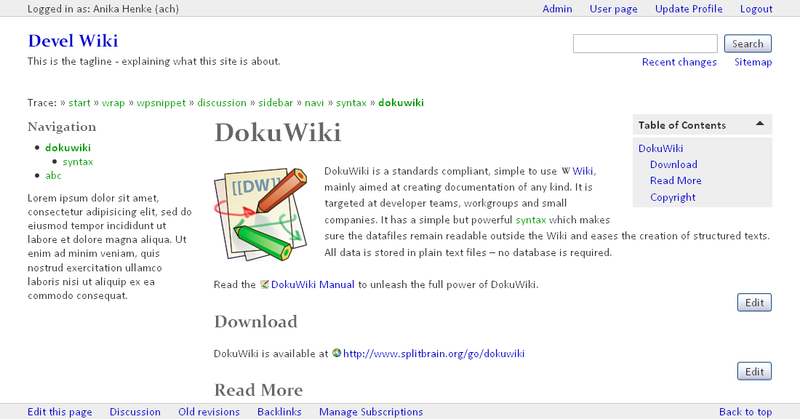 A minimal and clear looking theme for DokuWiki, focused on sharing your content. This template allows you to use any templates you wish for any namespace (or page) you wish. 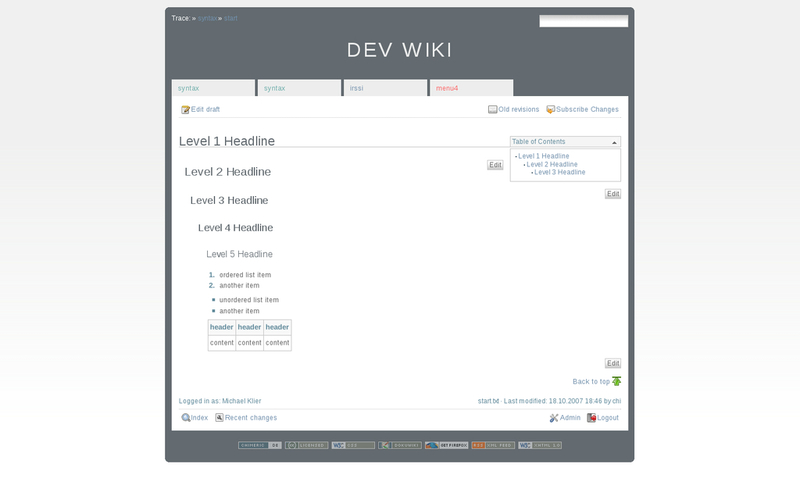 Please refer to the Template Development page to learn about creating your own templates. If you created a template, please share it by creating a new page in the template namespace. 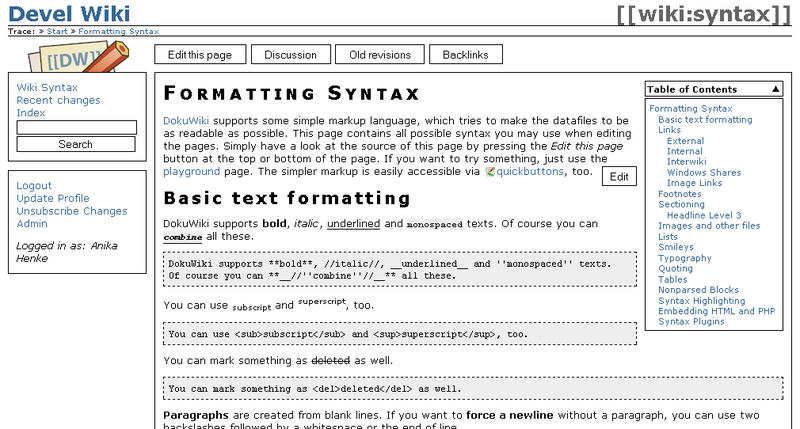 If you like to have a template ported to DokuWiki use the template wishlist sub-forum. Just extract the downloaded template archive (usually a .zip or .tgz file) in the /lib/tpl folder (If the zip file does not contain a folder itself, you have to create /lib/tpl<templatename> and unzip the template files into that one instead.). 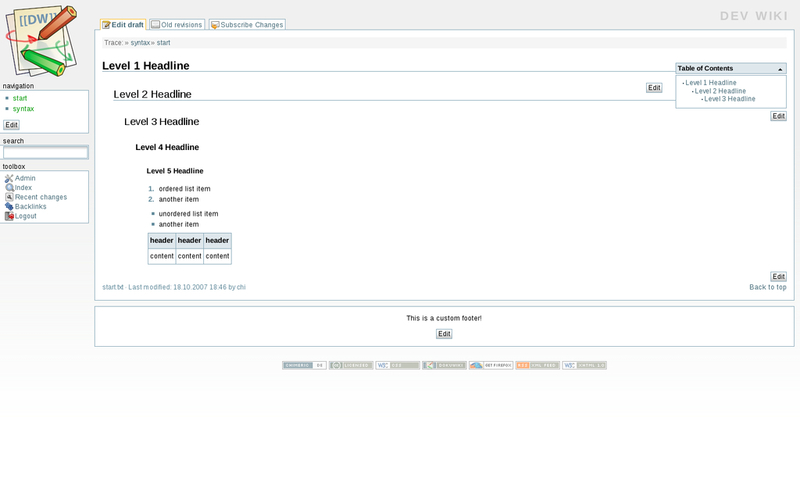 Then select the template in the Config Manager by adjusting the template option.